It was a long time ago when I first visited Enniscrone. I was 13 and I played a links that Eddie Hackett designed in 1970. 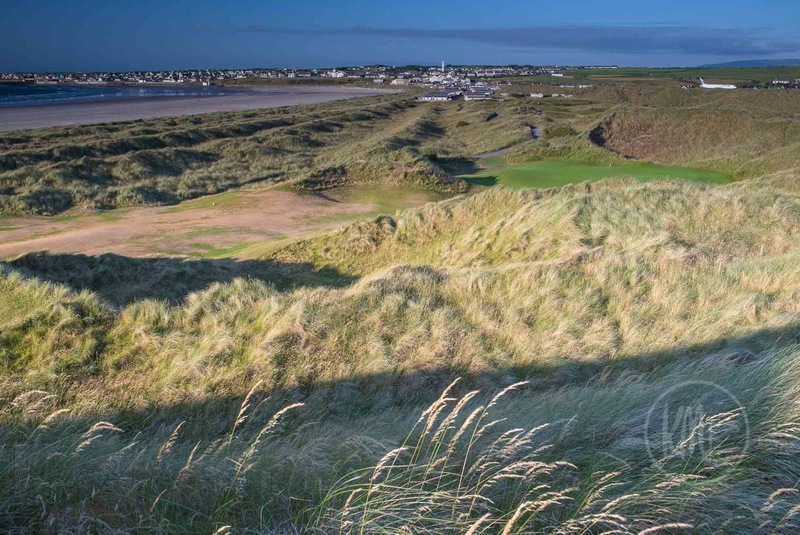 The course had been here since the 1930s but now holes slipped into the big dunes that divided the links from Killala Bay. It was also in 1970 that Hackett extended Enniscrone to 18 holes. Such an expansion was a long held dream of the golfers who called this club home… but in what has become a common theme of the past five decades, Enniscrone was never happy to rest. Instead the push for improvement and expansion, be it to the course, the facilities or the clubhouse, continued year after year. On Sunday two weeks ago, Enniscrone launched its centenary book. And while most tomes that celebrate a club’s longevity are penned by the elderly club historian, Sand, Sea and Sunsets: 100 Years of Enniscrone Golf Clubwas written by Cathal Mullaney, a young man just 23 years old.He has played golf at Enniscrone since he started at the age of 10 and has a special tie to the place. Thisbeautiful hardback publication is packed with photographs of one of Ireland’s most photogenic courses and 150 pages of history.It captures the essence of a club that has gone from strength to strength. The book may celebrate 100 years of evolution (and three different course locations) but the last 30 have proved to be the most explosive, the most defining. Those three decades have put Enniscrone on the world stage. The American magazine, Golf Week, ranked it the 10th best modern golf course in Great Britain & Ireland, in 2010, but international plaudits are surprisingly scarce thereafter. I rate it in my top three courses on this island, alongside Carne and Royal County Down. Played just once, Enniscrone is never forgotten, and I have been fortunate enough to play it many times in the past decade. 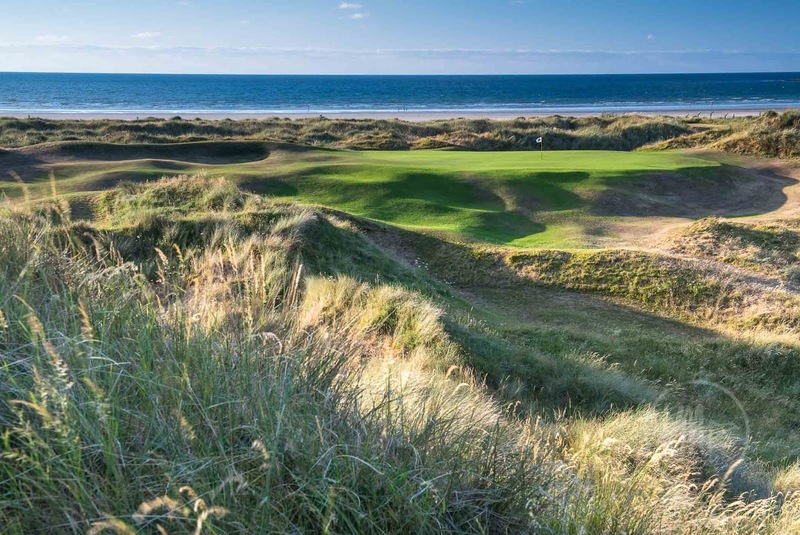 The club’s great leap forward came in 1999, when Donald Steel was asked to redesign the course and take it into the biggest dunes. Here, the ridges of sand rise 200 feet above the valleys and the hollows that are home to today’s holes. Steel achieved a great deal and, combined with Hackett’s earlier work, Enniscrone today boasts some of Ireland’s best holes. The quirky, short and rather terrifying 12th and 13th are two of Hackett’s best par fours, but the 10th and 11th are also his, with the latter proving to be the best of the course’s par threes. Steel removed the two flat par fives to start and threw golfers straight into the dunes to present an exhilarating opening. He also went further into the dunes than Hackett could go on the back nine with the result that Enniscrone now possesses one of the best closing stretches in Ireland. All of these details can be found in the new book, written by Cathal but, as he acknowledges, very much a team effort. 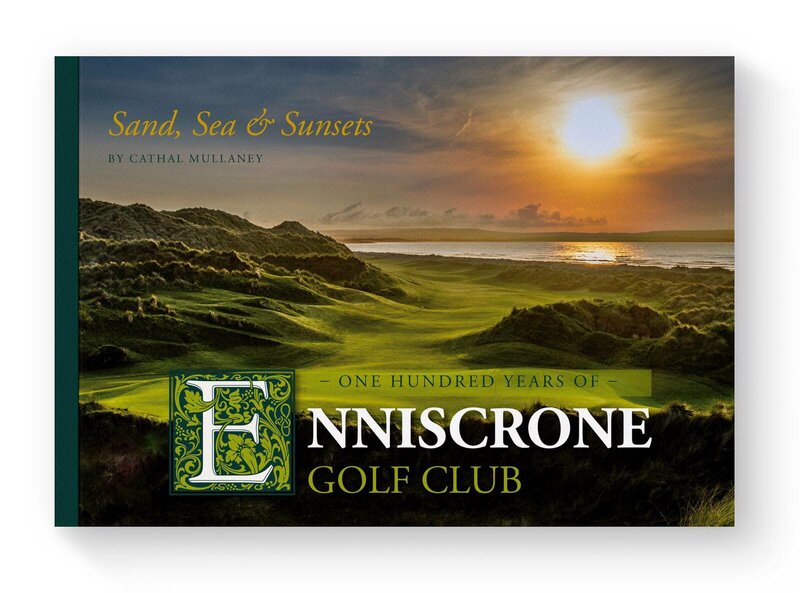 Sand, Sea and Sunsets: 100 Years of Enniscrone Golf Clubis available for purchase through the website (enniscronegolf.com) and in the Pro shop. The cost is €25.